Driving 30 mph is always boring and will probably get you asleep on the steering wheel. Aren’t you tired of always looking at this annoying speed limit sign and fearing that the cops will get you? Oh, that’s such a horrible feeling, I must say! But, not everything is so dark and even in the darkest corners, there’s still some light shedding upon us. Of course, we are talking about radar detectors. If you haven’t heard of these badass machines, now it’s time to introduce yourself to one. Valentine One Radar Detector is here to make all your long and short hauls enjoyable and harass-free. Furthermore, you can ask your girlfriend to buy it for you on Valentine’s Day… yeah, that’s pretty wise. If you are in a hurry or late at work, you can speed up a little bit, without the law enforcement surprising you at the nearest corner. And guess what? We’re gonna start our Valentine One review right now! Valentine Radar Detector comes with numerous important features, but let’s first see exactly how it looks. Quite frankly, it looks futuristic and somewhat… weird?! When you look at this thing, you’ll immediately notice its sleek, professional, albeit not-that-stylish look. The best way to describe it is to compare it to some sort of futuristic gadget that you see in Sci-Fi movies. But, I must admit that I like this design very much. In the box, we have all the necessary stuff to connect it, alongside the double suction cups. 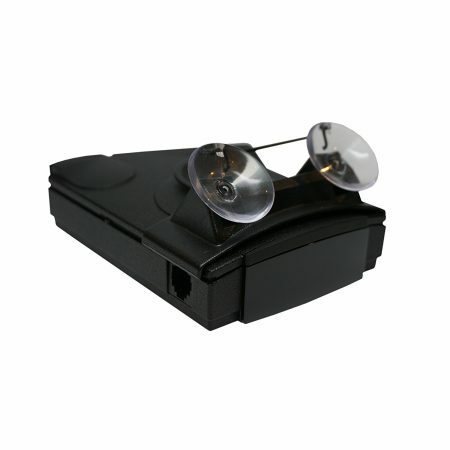 As this is a lightweight little boy, these suction cups will hold your radar detector firmly to the windshield, so all you need to do is… well, to power it up! Upon looking at its phenomenal display, I saw the letters L, Ka, K, and X. 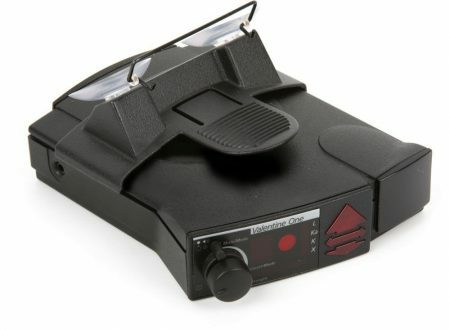 If you know the thing or two about radar detectors, you also know that these radar bands can be detected by Valentine V1 detector and pretty much by every other radar detector. The laser detection is one of my favorite features here. Valentine One Detector takes good care of providing 360-degree protection by utilizing multiple antennas. You can now detect threats from behind your car or at any other direction it comes from. This means that the speed traps aren’t going to be a problem anymore. Valentine One comes with an alphanumeric display, which can feel overwhelming for some users. Let’s explain how this screen works. When you see a directional arrow, it’s there to show you the direction of the threat. If you see a big number on your screen, it’s for informing you about the number of threats. It’s quite simple, although I would like the arrows to be a little more responsive. Now, when it comes to the alerts, Valentine One Detector will sing its song in a full glory. However, there is a Push-to-mute feature, which can spare you some of its singing. You can now take a complete control of the sound. There is a Control Knob which you can use to set the initial loudness as well as a muted volume of the alert. With this function, you can pretty much mute every alert thus having the quiet ride with your car. I found this feature very useful since Valentine V1 was way too responsive for my taste. Is there any kind of filtering here? Well, there is some filtering here and there, but it just didn’t work as I expected. Or maybe I have very high expectations? If you look carefully at the display, you can notice signs like J or V1. These signs are telling you that the alarm is false and you are left with that annoying sound of alarm until you get away from this point or simply mute the alarm. Come on, Valentine, you could’ve done this way better! I know most of you guys are opting for this Valentine One Radar Detector and the expectations are high, but I’m not that impressed with the set of feature we have here. For the price of $488.79 at the time of writing, you can surely get a better buy than this one. I’m aware that Valentine started back in 1992, and the progress is evident, but feature-wise, I would say that Valentine V1 is slightly above average. 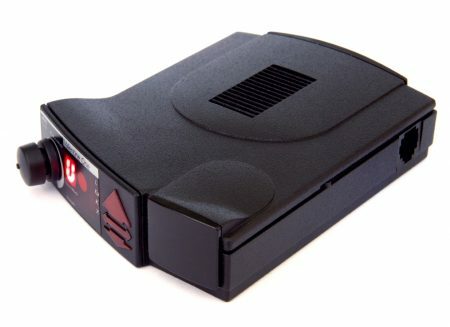 The first thing that will benefit most of the users is the design of this radar detector. As much as it’s all but ordinary, its black color will not distract you while you are driving, making it an unnoticeable and reliable companion. 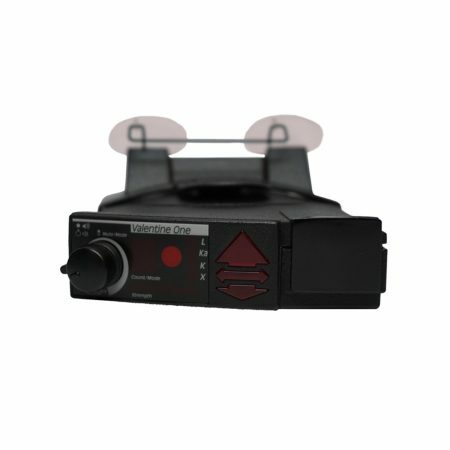 Valentine One Detector is able to detect a wide specter or signals such as X, K, Ka, Super Wideband Ka, and Laser Signals. It’s quite reliable and stable radar detector. Dual antennas in this radar detector are doing an excellent job of detecting every signal that’s coming towards your location. Arrow directional indicators are a nice addition, showing you the exact location of the potential threat. The push-to-mute feature does a great job of silencing the incoming alerts. You can now set the loudness for the initial alert sound, as well as a muted sound. Aside from directional arrows, Valentine One Radar Detectors gives you a total number of incoming threats. Valentine V1 is a little overpriced with its price of $488.79. The total amount of features offered could be more generous. This radar detector is very responsive, picking up even the false signals which I needed to constantly mute. Directional arrows work great from time to time, although they aren’t that responsive. If you want to see how this one ranked on our main buyer’s guide, click here. As with every product we review, the bottom line is inevitable. Valentine One Radar Detector doesn’t come with a huge plethora of features, but the features that are there are working great and provide sufficient performance. When we talk about the features in general, I think that this product is a little pricey, offering less variety than some of the competition. On the other side, $488.79 isn’t a small amount of cash to be just thrown around. I mean, if you have an average salary, you’ll agree with me. Nonetheless, with its dual antennas, a lot of detectable signals (including laser signals), push-to-mute feature, and directional arrows, I think that Valentine V1 is a stellar product, albeit not for the price. There were some annoyances due to the radar being very responsive and picking up unimportant signals. Furthermore, the directional arrows weren’t as fast as I expected. With all that in mind, I’ll stick to my Uniden R3 Radar Detector. It’s a lot cheaper and it’s a better performer.